I joined the Everyday Matters Yahoo group recently. They have a weekly challenge that members can choose to take. There are currently about 147 or so of these prompts. 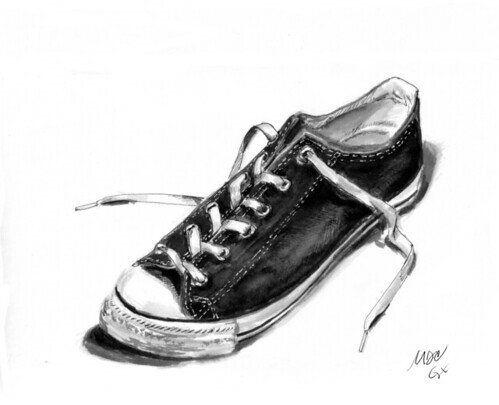 Well I decided to start at the beginning and do number one -draw a shoe. So I grab this shoe and realize how plain it is, but it is my favorite shoe so I resolved to try it anyway. After pacing around the room to psych myself up, I decided that ink washes would work. I laid down a light wash and realized that I had major control issues so I just grabbed my Pigma Microns and some gray brush pens instead. I used a Wite-out pen to put in the stitching on the shoe. I’m really pleased with how it turned out. Great shoe, I think we all have had a pair like this at least once. Great choic of medium, I like the little stitches. Thanks Deborah, I really appreciate your comments. I really enjoy your work…just found it. you are very talented! I like your art. I wish I can draw like you. I do simple art, use acrylic paint and my imagination, but it is absolutely amateur. Elena, thank you so much. I really like your pillows. I wish I had a flair for design, but alas I do not. I’d say we’re both pretty talented. very well done…..and i still have to learn to draw! pervaiz, thanks for coming by and leaving such a nice comment. I really appreciate it. Jeez–I really like this shoe! And thanks for telling me about that yahoo group. I love your list of sketchblogs, which I’ve been exploring in depth, and i hope you will add ours to your list! Sandy, thanks for stopping by. The Everyday Matters group is a great way to meet more artists, discover other blogs and share all kinds of information. I hope you and Cheryl give it a try. that is incretable shoe! i really wish i could draw just like you! i tried drawing that shoe, but it din’t turn out very well.